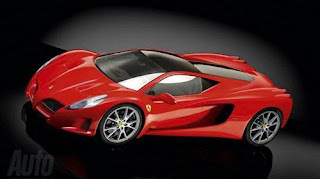 Over the next three years, Ferrari will introduce a new 458 Spider, Ferrari Enzo "special series", and four other new models. The cars have been announced by Fiat and Chrysler CEO Sergio Marchionne at a press conference earlier today. Ferrari is said be to focusing on reducing the next generation Enzo’s mass in an attempt to increase speed and handling without necessarily having to force more air and fuel into the F70’s combustion chambers. The way it looks now, the F70 will be based around a compact footprint and weigh in at no more than 1,000 kilograms. Meanwhile under the rear deck lid there is rumored to sit a supercharged V8 making a maximum output of 700 HP when it is unveiled in 2012. Like Enzo Ferrari always said, build one less then you think you can sell, so the very special F70 will be limited to only 399 units. According to AutoWeek, Luca Cordero di Montezemolo – head of Ferrari – has confirmed that the next ‘Enzo’ will feature hybrid technology, similar to that used on the 599 HY-KERS.